Innsbruck, Austria is the home of SPURart Designs. SPURart teaches people how to build their own board. 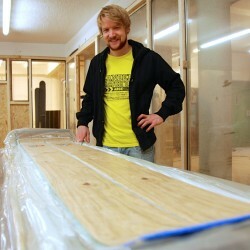 Three-day workshops end with a personally made board(s) for the price of 690 Euros ($905 dollars). Workshops include discussions on size, material selections, graphics, and build methods. Experts in design and build are there to assist you in the process. The building process involves sawing and sanding raw materials to your custom shape. Multiple layers of materials are glued together to make a “sandwich”. The sandwich is placed in a pressure oven. After the ski/board is trimmed and cleaned, bindings are installed and you're ready to ski/ride it.